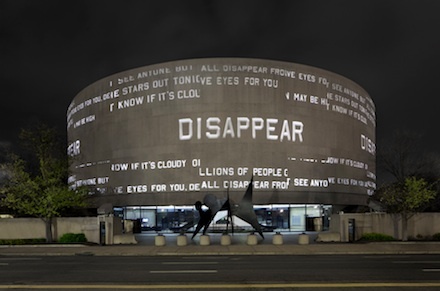 Doug Aitken, Song 1 (2012). All images via Hirschhorn Museum. The work of LA based artist Doug Aitken spans across a range of media and genres, traversing formal and conceptual terrains from watercolor to Fluxus-like happenings, book publishing to operas, and photography to public art. Largely known for his video installations, his work is equally anchored in audio, shifting in recent years to engage closely with sound as an index of space and time, deeply resonant with the contemporary human experience. 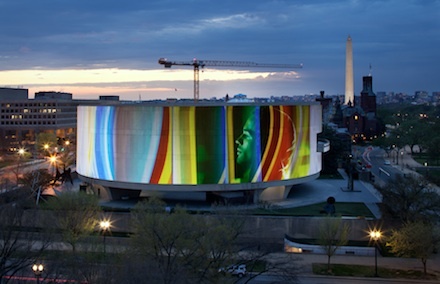 The collusion of visual modalities with sound experiments and musical production propels his investigation of perceptual experience in his most recent work, Song 1, now exhibited at the Hirschhorn Museum in Washington DC, on view from dusk until midnight through May 13. 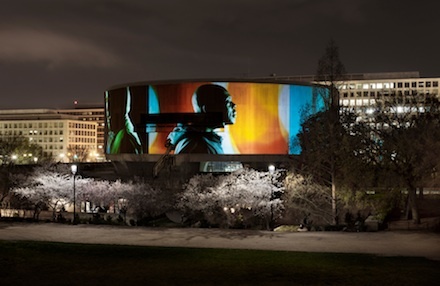 This spectacular temporary exhibition epitomizes the fluid integration of music and image in a site-specific installation that literally inverts the art museum and transforms the surrounding landscape into a 360 degree cinema. Projected upon Gordon Bunshaft’s cylindrical cement fortress, Aitken has composed a 35 minute loop of video that revolves around the museum’s cylindrical facade, veiling its bulky structure in a graceful and arresting play of light. Yet it is the accompanying score that is truly at the core of this project, comprised of a succession of covers of the song “I Only Have Eyes for You,” interpreted by a diverse checklist of musicians, which feature as the organizing principle governing an entangled loop of fragmented narratives and flashing images. “I Only Have Eyes for You,” originally written for Busby Berkeley’s 1934 film Dames by Harry Warren and Al Dubin, has been covered over 100 times since, thereby entering into a kind of pop-cultural collective unconscious—recognizable, catchy, musical white noise, or what Atiken describes as “like a sonic wallpaper. It’s ubiquitous, the kind of thing everyone has passed through or heard in a gas station at some point in their life.” The artist has employed several wildly different musicians to reinterpret the song yet again, including Beck, Devandra Banhart, James Murphy of LCD Soundsystem, Hisham Bharoocha (Soft Circle) and John Doe (of X), to name a few, each rendition unique in genre and approach, yet all adhering to the same tempo of 60 beats per minute. This common tune acts as the universalizing constant in the flickering sequence of visuals—from episodic character-driven vignettes to abstracted stills and floating text. The fragmented index of images—streaming traffic lights along the highway, spinning reel-to-reels (which evoke the circular form of the building itself), palm trees, a monumental row of candles, tumbling lyrics—create a formal collage as protean as the soundtrack. There exists a synchronicity within the visual frameworks of the multiple projections, yet Aitken’s vision is fundamentally anchored in song. He said, “The idea of the song became the passport to map that modern landscape”—a means of navigating the cultural terrain of urban contemporary life, his agent (and instrument) of expression. Aitken’s interest in sonic rhythms and auditory landscapes has featured in previous works such as his Sound Pavilion (2009), which records and broadcasts the earth’s tectonic movements using geo-microphones, and sleepwalkers (2007), which employed the ambient sounds of the city as the soundtrack to his video installation. 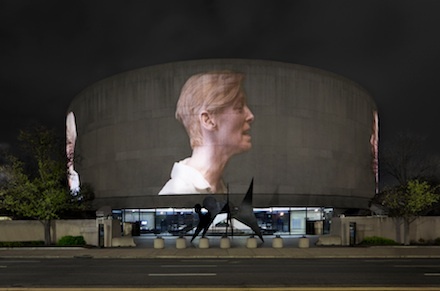 Now a major player in contemporary video art, Aitken achieved international acclaim in 1999, winning the Golden Lion International Prize at the Venice Biennale, for his video electric earth, instigating a host of video installations that create unique cinematic environments out of multiple projections. 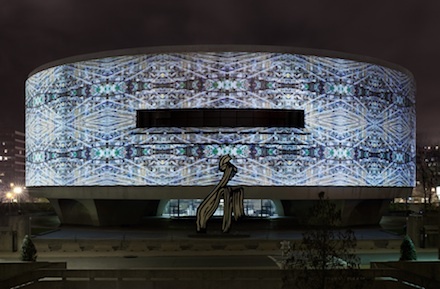 Song 1 is not the first of these to project film onto a museum façade. 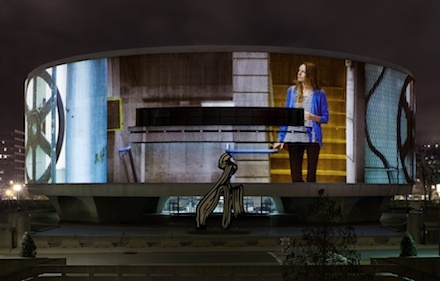 In 2005, Aitken transformed London’s Serpentine Gallery into a complete video work called new ocean, utilizing every surface from basement to the cupola as a screen for his complex installation. In 2007 Aitken took over New York MoMA’s courtyard for sleepwalkers, projecting footage onto multiple steel and glass planes. 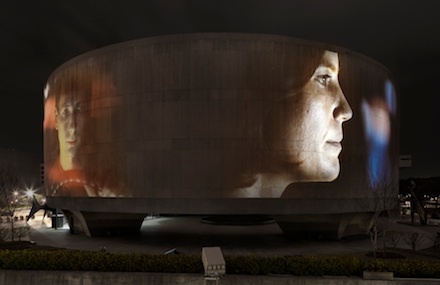 And again in 2008, Aitken screened migration on the walls of the Carnegie Museum of Art in Pittsburgh. 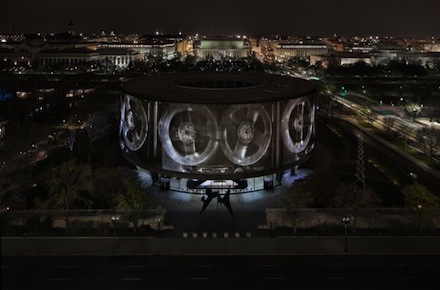 While each of these works employed multiple display screens, in Song 1 the eleven projectors are orchestrated to seamlessly fuse the images into a unified whole—an endless ring of visual information. Describing his cinematic efforts, Aitken said he ventured “to break the screen in a sense, so you’re no longer composing for a rectangle with a passive viewer, but instead you’re making something that can possibly empower the viewer to navigate their own narrative and create their own perceptional experience out of something which can’t really be consumed from any angle and doesn’t really have a start or finish.” The film has been carefully edited in tandem with the painstaking orchestration of the high-definition projectors to blend eleven sources into one complete vision spanning the building’s circumference, discarding conventions of a singular viewing position, and creating an active dialogue with the audience, who, in circumambulating the structure, experience an endless variety of views from every unique vantage point and moment in time. Aitken’s syntactic innovation of formal cinematic vocabularies has reached a zenith in Song 1, where the physical bounds of the pictorial plane within a defined frame are reimagined as an orbiting loop, fragmenting time and space in a complex audiovisual and architectural intervention on the National Mall. 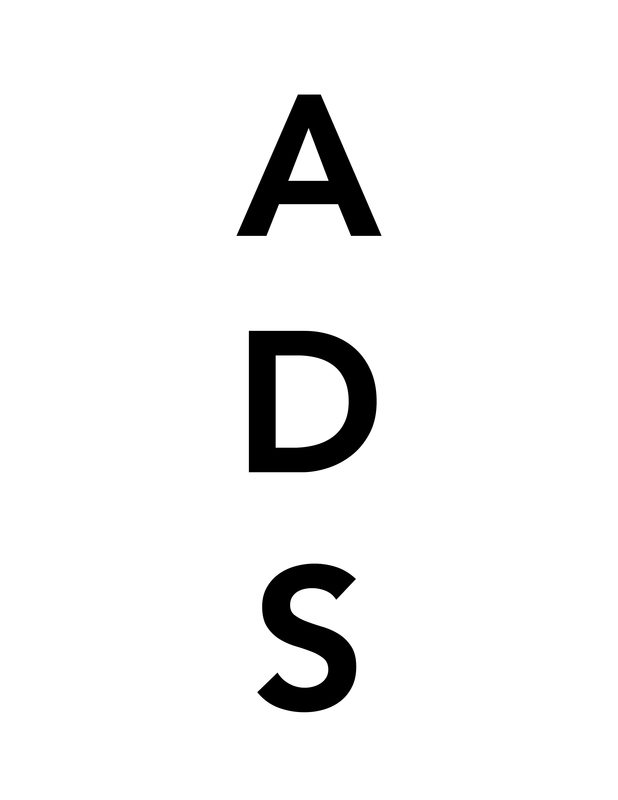 This entry was posted on Wednesday, April 11th, 2012 at 7:00 am	and is filed under Art News, Go See. You can follow any responses to this entry through the RSS 2.0 feed. You can leave a response, or trackback from your own site.